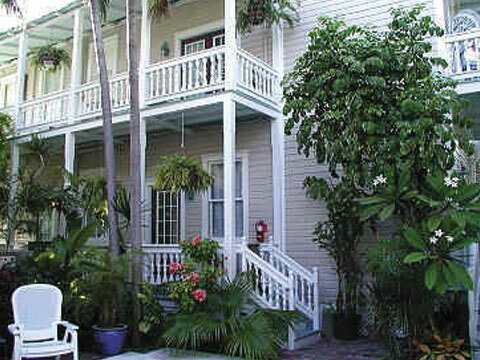 Nestled in the heart of Key West's "Old Town" Historic District, the Coco Plum Inn offers one of the finest locations of any resort in all of Key West. We are conveniently located just 1 block from legendary Duval Street, and just 3 blocks from the historic home of Ernest Hemingway and the Key West Lighthouse. Walk to the Beach, and all of Key West's infamous attractions, shops, entertainment and night-life. Our completely renovated Historic Homes, circa 1891, offer luxurious and spacious accommodations that feature one-of-a-kind antique furnishings, King or Queen beds, large private baths and upscale, truly breathtaking decor. Each room boasts it's own unique allure and charm while the private bath has been custom designed for pampering with designer tile work and enticements that include walk-in showers, a dual fixture walk-in shower for two and a jacuzzi to name just a few. If you are traveling with friends or as a group, ask about our 2 and 3 bedroom suites which are available as well. All accommodations include A/C, ceiling fan, color T.V. with cable, refrigerator/freeze and coffee maker as well as a private entrance and porch for added security and comfort. If total relaxation and escaping into paradise is all you seek during your stay, feel free to put your feet up and enjoy our beautifully decorated living rooms, large private pool, lush tropical garden or simply lounge in the warm sun on the spacious patios which offer seclusion from the world outside of "your sanctuary". Oh yes..I almost forgot! If your mouth is not yet watering at the thought of unwinding here in Key West as our guest, it will after learning that each night's stay also includes a professionally prepared, complimentary breakfast. This is no ordinary, run-of-the-mill breakfast mind you, but instead a full menu of gourmet treats to start your day right. I won't divulge the entire menu of offerings but you can Indulge yourself with traditional breakfast fare or reward yourself with morning delights such as pancakes and waffles stuffed with strawberries or chocolate (to name a couple), all homemade and professionally pr At the Coco Plum Inn, you can experience the "Old World" charm and tropical paradise of Historic Key West while still treating yourself to the abundance of shopping, fine dining, entertainment and history that Key West is known for. It's all up to you and your desires here at the Coco Plum Inn.